After a local middle school rennovated a couple of classrooms, old oak shelving boards were discarded & left for the refuse company to dispose. 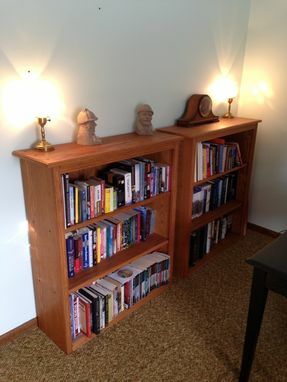 The oak boards were stripped of the finish, planed & sanded, and cut/assembled into the Book Shelves that are pictured here. The new Book Shelves were stained a golden oak color and coated with polyurethane.